Taxidermy, matted vintage wigs, floor-to-ceiling gilded antique portraits. A hoarder’s dream wonderland is the cluttered setting for the latest Glen Luchford-shot campaign from Gucci for their Winter 2018 collection, and lush is an understatement. 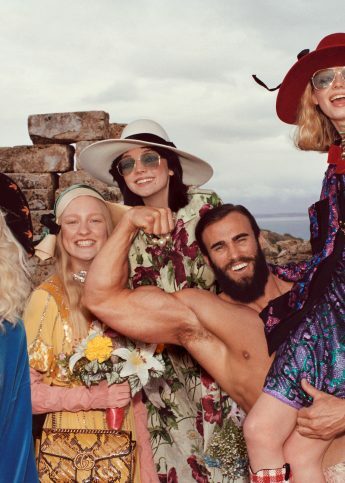 Inspired by “those eccentric personalities who passionately seek out paintings, antiques, rare objects and other vintage collectibles”, the shots show the luxurious garments and jewellery grounded by settings akin to a seaside charity shop, with the oddball characters somehow fitting seamlessly into their eccentric surroundings. Two models trussed up in sweaters and spectacles lounge on the floor immersed in an unfinished puzzle. One in a silk floral two-piece takes a feather duster to a wall of cuckoo clocks. Luxe gold chain loafers stand out among endless piles of fine china. Back in February, transformation and fantasy was the name of the game, with eerie severed heads, gnarled horns and baby dragons taking over a surgical operating theatre for Gucci’s Winter 2018 show. But for Alessandro Michele’s accompanying campaign, “Gucci Collectors”, it’s all about embracing what you’ve got. Individuality. Here’s to letting your freak flag fly.